We got the Obama Mix popcorn during the outdoor movie at NOMA. We really enjoyed the popcorn. It was a great movie treat. 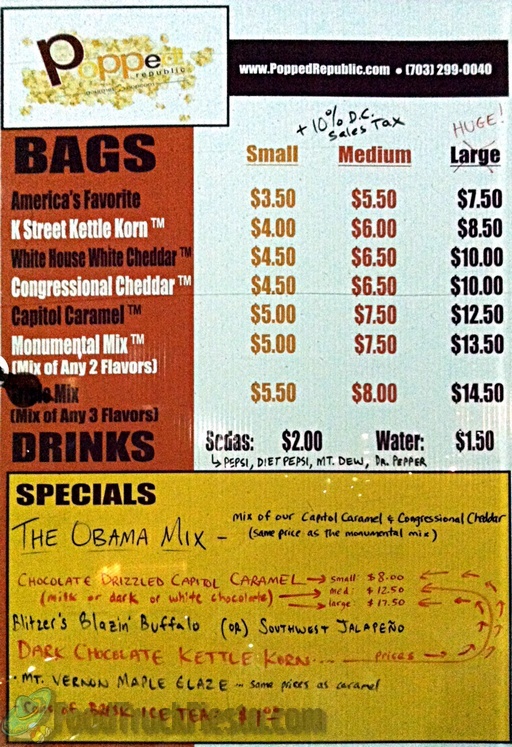 I lived in Chicago for awhile where Garrett's popcorn is the gold standard and the most popular is the caramel and cheddar mix (which is what the Obama mix consists of.) I thought that this popcorn was very close to Garrett's popcorn in Chicago. It was fresh with a perfect combination of sweet and salty. We had some left over and ate it the next day and it was still pretty good. 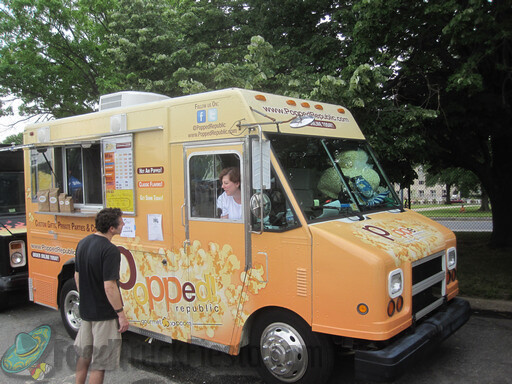 It is a bit expensive for popcorn but it is a food truck in DC so I am not surprised. I will definitely get more popcorn from them again! Popcorn is delicious, plenty of fun flavors to choose from. The service is always fantastic too, which is nice! -Popcorn seemed to be absolutely drenched in some butter/oil before the cheese powder. It made the popcorn very heavy feeling. -Overall the flavor was not that great. Smartfood is better than this. So, all in all, it could be worse, but if you are looking for a popcorn food truck, go to Stella's. Friendlier service and better noms. The popcorn was stale and hard as a rock. I ending up throwing it out. Should have tried it first. Hope the other flavors are fresher. Great popcorn at fairly reasonable prices. When you get a bag of popcorn from this truck, they fill it all the way to the top. They just stuff the bags with popcorn. Very generous portions. By comparison, you can pay the same amount of money at Stella's Popcorn truck for a half-filled bag. Such a rip-off by comparison. I've had the butter, white cheddar and carmel popcorn and all are really good. Ok. So I'm writing a review because you all delivered popcorn for my best friends wedding reception 3/23/2013. The popcorn was absolutely amazing!!!! Ok. So I'm writing a review because you all delivered popcorn for my best friends wedding reception 3/23/2013. The popcorn was absolutely amazing!!!! She passed out individual bags to all of her guests that were invited to the reception and we devoured it!!! My best friend dealt directly with you all (& trust me if she was not given great customer service you all would not have had her as a customer) so I know customer service was awesome!!! Love the popcorn!!!! Come back down to the CNN BLDG., we need some popcorn, now!!!! Popped! 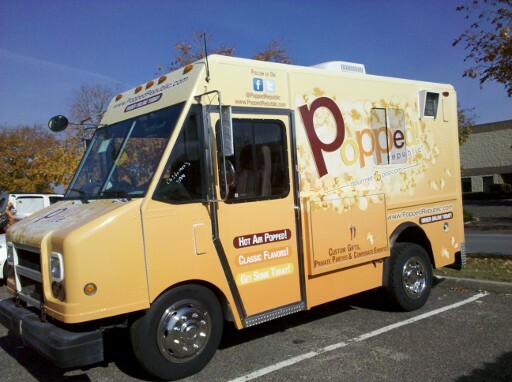 Republic, the first gourmet hot air-popped popcorn company in our nation’s capital, will soon be joining (Feb 2012) the food truck scene in Washington DC. Popped! Republic will offer the finest in gourmet popcorn in a selection of classic and enlivening flavors and will be licensed in DC, with Montgomery County and Arlington to follow. Weekly specialty flavors and freshly popped movie theater-style buttered popcorn will be offered on the Popped! Republic mobile truck.